Barbara from Stray Thoughts is here to host this month's discussion. She will share her thoughts below but first I just want to say that I always appreciate the books that Barbara chooses for us. She tends towards Christian classics which is fantastic. I'm glad to include those among the Reading to Know Book Club reads because, after all, I am a Christian and I would hope that is reflected in everything I do, right down to book club choices. I know Barbara feels the same and so I value her input into this little club. Secondly, I appreciate her reads because she has exposed herself to a lot of books which I haven't paid much attention to. It is good to be given reason and opportunity to pick up books which she has loved and grapple through them a bit myself. I may not always love the book, but I love the thoughts and theological arguments which her choices cause me to work through. The books Barbara has selected for us may be short but they always manage to pack a punch and that makes them exciting to me. I have read The Screwtape Letters but have been wanting to re-read them so I was delighted when Barbara said she would be choosing this title. I think it'll make for fun discussion. 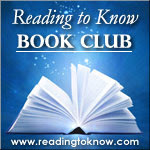 I have been honored that Carrie has asked me to choose a book for her Reading to Know Book Club for the past few years. Normally I choose a book I know, love, have reread multiple times, and am eager to share with others. 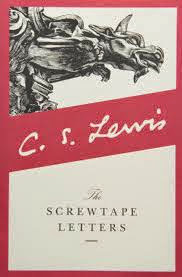 This year I chose a book I have never read before: The Screwtape Letters by C. S. Lewis. It is a series of letters that a senior demon writes to a junior demon-in-training. I enjoy reading Lewis, but I have avoided this book. Years ago when I first became a Christian, there was an emphasis on spiritual warfare that was honestly a little wonky in places. I read some of that kind of thing at the time, but later on avoided it except for when I would come across it in my Bible reading or heard it preached in church. I was always a little afraid of the devil. I knew he was greater and stronger than I was. I also knew that Jesus in me was greater than him, but I'd still rather keep my distance. I had this subconscious naive notion that if I left the devil alone, I wouldn't attract his attention and he wouldn't bother me as much. Some friends and I discussed once that our flesh gave us so much trouble that the devil didn't really have to do too much with us. Both are mistaken and unbiblical views. On the opposite extreme, I have also known people who give the devil too much credit and see him behind every problem or issue. It's good to be balanced in this area. After reading some other Lewis books this year, I looked up some excerpts from this book online and felt that it was finally time to read it. The verse that keeps coming to mind is II Corinthians 2:11: "Lest Satan should get an advantage of us: for we are not ignorant of his devices." It doesn't pay to be ignorant of his ways. From what I have seen so far, Lewis handles this whole topic with humor in some places but with convicting accuracy. I am looking forward to finally delving into this one because it is a classic I have neglected, because it is Lewis, and because I think it will be spiritually helpful. I hope you'll join us. Let us know if you plan to read along! We love hearing from you. I actually just finished listening to an audio version of the book over the weekend. I've got a draft review up that I will polish and post at some point this month. I'd never read it before, so thanks for getting me to read it. P.S. Can't wait to hear all about your trip to England!